Top Stories: Feds To Sue Banks; Gulf Coast To Get Drenched : The Two-Way The government is preparing to sue more than a dozen banks, alleging they misrepresented the quality of mortgage securities, The New York Times reports. The most anticipated story of the day, which we reported about earlier, is the 8:30 a.m. ET release of the August employment report. We've also already posted about a strong earthquake that was detected in the last hour off the Aleutian Islands. -- "U.S. Is Set To Sue a Dozen Big Banks Over Mortgages." The New York Times reports that "the federal agency that oversees the mortgage giants Fannie Mae and Freddie Mac is set to file suits against more than a dozen big banks, accusing them of misrepresenting the quality of mortgage securities they assembled and sold at the height of the housing bubble, and seeking billions of dollars in compensation." -- "Gulf Braces For Rain From Tropical Depression." "A slow-moving tropical depression was slogging toward the Gulf coast Friday, packing walloping rains that could drench the region with up to 20 inches," The Associated Press reports. "Louisiana's governor declared a state of emergency Thursday because of the threat of flash flooding. Tropical storm warnings were issued from Mississippi to Texas including New Orleans." -- "Libya Interim Leaders Vow Tolerance And Respect For Law." The BBC writes that "Libya's new interim leaders have assured world leaders they will build a society full of tolerance and respect for the rule of law. Speaking at a Paris meeting, National Transitional Council (NTC) head Mustafa Abdel Jalil promised a new constitution and elections within 18 months." 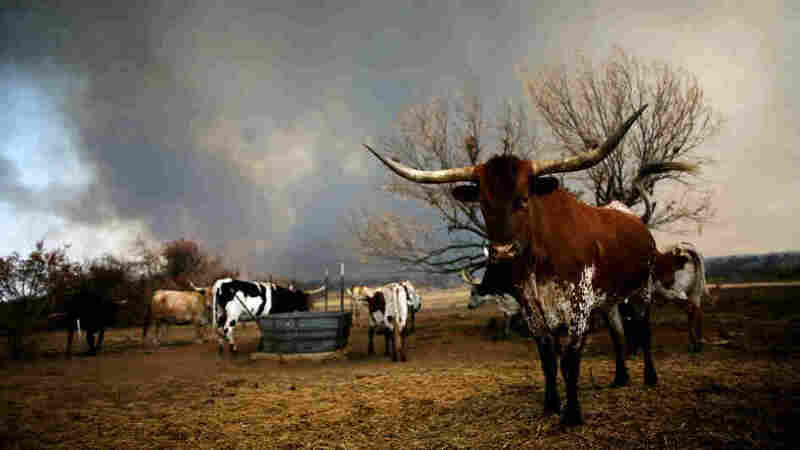 In Graford, Texas, on Thursday: Longhorn cattle stood by as a wildfire burned in the distance. -- "Weather May Help Fight Against Big Texas Fire." According to the Los Angeles Times, "North Texas fire officials were hopeful Thursday that cool weather and calm winds forecast over the weekend would help firefighters quell the largest of the state's several wildfires, a blaze that has destroyed at least 39 homes this week." -- After Irene, "Frustrations Rise For Those Still Without Power." "With Hurricane Irene's floodwaters receding across much of the East Coast, homeowners are mucking out their basements and dragging soggy furniture to the curb," The Associated Press writes. "But frustrations are rising as the wait for power drags on, with an estimated 895,000 homes and businesses still without electricity."